Engineered from the ground up for ultimate tone and feel. Hand-polished to a beautiful mirror finish. - not just a means of playing the notes. The world's finest metal guitar slides. To achieve a rich, solid tone our steel slides are machined from solid billets of the highest-quality marine-grade 316L stainless steel. This produces a hard metal surface with good weight and durability. The edges of our slides are cut to a precision radius to ensure a silky-smooth glide across the strings with no snagging. Finally, the surface is lovingly hand-polished to a beautiful mirror sheen to achieve the lowest friction and string noise possible. The result is a thoroughly professional slide, able to handle any playing style with ease and sound fabulous on any guitar, whatever the setup. To produce something utterly unique, we took our stainless steel cores and applied a range of high-tech chemical vapour deposition and sputtered coatings to produce a range of slides with amazing properties. With a hardness of up to 15 times that of steel, these slides are extremely durable and introduce many of the tonal characteristics usually attributed to glass. Depending on the coating used, we can focus the tone towards warmth and depth, or achieve a brighter, more strident sound. Improving on the performance of our stainless steel slides was a tough challenge; our coated slides build on that success and provide a sound and feel that simply cannot be obtained anywhere else. The "Bugatti Veyron" of guitar slides. Completely hand crafted from a material that is twice as dense as steel and nearly as hard as diamond, our solid tungsten carbide slides feel and sound like nothing else on Earth. The weight produces an incredibly solid, rich fundamental - especially on the wound bass strings - and unparalleled sustain, while remaining comfortable and agile. Combining the best characteristics of metal, glass and ceramic, then taking it all one step further, these slides open up an astonishing palette of controllable tone, and are uniquely sensitive to playing style. The eight weeks it takes to make a tungsten carbide slide is worth waiting for... these superb slides are truly the pinnacle of slide innovation today. "These are literally the finest slides available, anywhere... If you're a slide player, this could change your life." Your slide is an essential, tone-creating part of your instrument - not just a means of playing the notes. 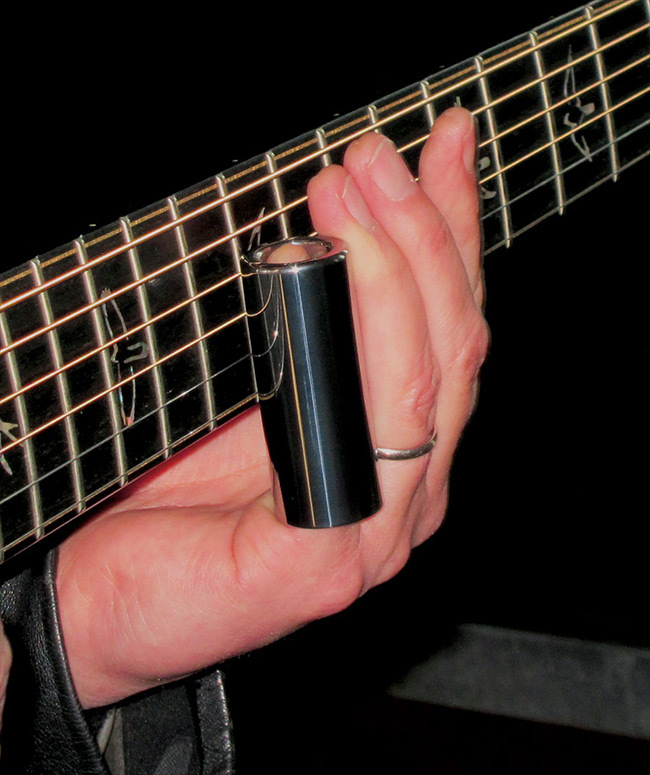 Unlike other slides, every Wolfram slide is designed and engineered from the ground up to be a guitar slide. Many of our sides employ our distinctive compound-radius edges - combining two or more different radii to achieve smooth, slick playing feel while keeping as much of the slide 'in play' as possible. Other signature features on many models include our famous tapered inner bore and curved slides. We realise our vision with great precision, machining every slide to a tolerance of five hundredths of a millimetre for absolute consistency. We don't just cut slides from pre-formed metal tube; whether you choose our marine-grade stainless steel, beautiful aerospace coatings or custom-sintered nickel tungsten carbide metal matrix composite, you can be sure that your slide has been engineered from carefully-chosen raw material for ther tone, feel, performance and durability. Every one of our slides is lovingly polished by hand to a mirror-sheen to achieve the smoothest possible, low-friction playing surface. Rattles, scratches and string noise are a thing of the past, as is string drag. Expect a silky-smooth glide from your Wolfram slide, both across and along the strings. There's no avoiding it - the weight of a slide is a huge influence on the sustain and tone you can achieve from your guitar. Overly-light slides are one of the commonest reasons for players needing to raise their action or use heavier strings. All Wolfram slides are engineered with a delicate balance between material choice, size and weight to achieve a great tone from any guitar, whatever the strings, whatever the setup. Our slides are designed to meet the needs of hard-playing professionals, who need a slide to be comfortable for many hours of playing, day after day, and agile enough to tackle any musical style with finesse. No other slide in the world is made with the level of care and attention of a Wolfram slide. We are fanatical about quality - if it isn't absolutely perfect, it will never leave our workshop.